The indomitable Vera Brittain became the first person to document war from a woman’s point of view and, in so doing, changed the way a generation regarded itself and its actions. 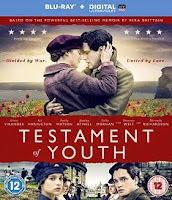 Her defining testimony becomes a searing story of love, war and remembrance as TESTAMENT OF YOUTH arrives on Blu-ray and DVD on 25th May 2015 and digitally on 8th May 2015, courtesy of Lionsgate Home Entertainment. And to celebrate we have 3 copies to give away on Blu-ray! Vera Brittain (Alicia Vikander – Ex Machina, Anna Karenina), irrepressible, intelligent and free-minded, overcomes the prejudices of her family and hometown to win a scholarship to Oxford. With everything to live for, she falls in love with her brother’s close friend Roland Leighton (Kit Harington – TV’s Game Of Thrones, Pompeii) as they go to University to pursue their literary dreams. But the First World War is looming and as the boys leave for the front Vera realises she cannot sit idly by as her peers fight for their country, so volunteers as a nurse. She works tirelessly, experiencing all the griefs of war, as one by one her fiancé, her brother and their closest friends are all killed and the pillars of her world shattered. However, an indefatigable spirit, Vera endures and returns to Oxford, irrevocably changed, yet determined to find a new purpose which spurs her towards a redemptive act of remembrance.